“Divide and Rule!” has been the motto of empires from time immemorial. Although the tactic be most cited in discussions of foreign affairs, its application at home is from time to time crucial. One can’t rule the world without keeping one’s own nation under control, and this is an essential prerequisite for empire maintenance abroad. Keeping people from becoming united in promoting intelligent and fair minded political or economic reform has always been fundamental for any wealthy gang ruling by the sword or fire power, enforcing their usurpation of enough control of land and means of sustenance in order create either serfdom or wage slavery. One notices that although the past election brought the unity of a Democratic executive enjoying majority leadership of his party in both houses of Congress, soon after the inauguration, corporate controlled media began dedicating most of its national news coverage and commentary to the inner wheeling and dealing of Republicans, projecting them as of more critical national importance than any deliberations of governing Democrats who had won the approval of the majority of an electorate dissatisfied with Republican party rule. A political cartoon in the Denver Post encapsulates well what corporate media has promoted, namely, as illustrated, an impotent and paralyzed status quo that enables media’s corporate military sponsors to do their thing unmolested by any viable political opposition . Blind to the suffering of majority Mankind, the mechanically operating grey eminence of directors within the Financial-Military-Industrial-Complex dictating government foreign policy, not just since the Eisenhower administration, but since before the Civil War, have also discounted the suffering of Americans. (Who are made to suffer to a much lesser degree than their fellow human beings abroad in a U.S. dominated Third World). And just as its State Department promotes civil wars abroad to “divide and rule,” its compliant media similarly promotes rank, relentless and uncompromising confrontation on all issues within the country, be it abortion, homosexual rights, health care, immigration, environmental protection or any other domestic issue, in order to create divisiveness, confusion and avoid harmonious solutions, permitting corporations to “”divide and rule” America. It might not seem surprising that the empire establishment is having its obedient media focus on a proto-fascist movement that would end all restraint on the preeminence of corporations in America. But it is odd, because at the moment there is no threat to its absolute power from that far less vocal portion of the population that is not totally enfeebled by the egotism and thirst for material accumulation beamed and directed at it through psyche penetrating distractions of clever mass consumer marketing advertising embedded in entertainment and in manipulated and deceptive information/news. Sarah Palin’s farcical call for some rabid but undefined sort of revolutionary action draws on her dis-educated followers’ storehouse of fear and disinformation salted away over generations of subtle brain washing by capitalist controlled media emitting criminal deceptions – preying on minds of the innocent made gullible for the impoverishment of spirit in life under the dog-eat-dog low wage economy that favors America’s super rich. The apex or apogee of incomprehensibility is that in a world containing the Scandinavian and other European highly socialized model of more or less democratically controlled capitalist political economies, the highly capitalist economy of Communist China, and more than a half dozen popular elected presidents in Latin American seeking to emulate the social success in health and education of Communist Cuba, in the nation that leads in scientific innovation and space exploration, an all dominating media cartel is able to restrict public debate to the functioning of strict and unbridled capitalism. Frightening, for well informed Americans of normal mind, unable to dent the media wall blocking public awareness and skewering priorities, realize that their ever weakening minority position is analogous to that of socialists during the rise of Adolph Hitler. Socialists had represented the largest segment of the German population since before World War I, and were still strong, though struggling, into the early 1930s. As the Nazi movement (supported by American bankers and industrialist) became increasingly hailed in the German media, socialists were driven underground. Socialists, anti-capitalists and populists in the U.S. have long ago lost the mass appeal they enjoyed during in the 1930s and through the beginning of the Cold War. Today’s disunited progressives cannot imagine organizing a mass of voters like the Tea Party movement has been able to mobilize so quickly. The large following of now deceased Howard Zinn and filmmaker Michael Moore, except for small peace and antiwar organizations, is made up of silent socialists and disheartened individuals unable to adjust to American imperialism and stomach desperate patriotism, even torture as a way of life. These Americans have nothing of the cohesion and tradition of political participation that the electronic media evangelists have long put together taking advantage of the prevalence of a multitude of angry and depressed, undereducated and unsophisticated members of a disenfranchised lower middle class. . Even as commercial media is managing, filtering, distorting information and blocking all sociopolitical awareness, the fanatical capitalist right wing eerily insists vociferously that most TV channels have a preponderance of liberal, socialist, or communist bias and insidious unpatriotic programing. Corporate media promotion of a wildly militant right wing in American politics could be an indication that the priorities of the military will soon come to be even more important within corporate governance than the less direct and defused prerogatives of the financial power center. Newsweek’s Fareed Zakaria with his TV show Global Public Square, Sundays on CNN, seems a good weathervane for where the nation is being taken. Zakaria in many ways has taken the place once occupied by William Buckley as the prominent intellectual of the uncompromising Right and unofficial spokesman for extreme capitalism during its most advanced imperialist phase. Unlike Buckley, he aims to present his opinions, guidance and evaluations as slightly centrist. But Zakaria’s pseudo centrist mulling over the meaning of current events consistently includes arguments for the “logic’ and necessity of moving ever further to the right. Perhaps a faint diminishment of danger could possibly be occasioned by a growth of public disenchantment with the hideous ignorance on flagrant display in media as Sarah Palin, and those who champion her, are seen as almost seconding the “sentiments’ of neo-fascist white racists. This scary realization could be a source of some enlightenment for the ever larger, increasingly apprehensive and less insanely pro-war segment of the American public. 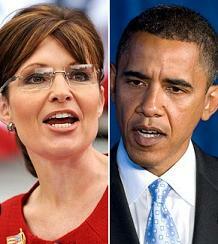 However, Obama and Sarah Palin BOTH exalt the same military leadership that gives them both the OKay. They are two loyal representatives of wealthy and influential investors in war industry and the industry’s laterally connected high military officials. Yet media conglomerates intend for the public to see them as two political stars in confrontation. They both go along with and play out this hoax, which cleaves the national constituency conveniently in two making it easier to manage. Both hail the Constitution just as the ruling upper class they represent has hailed the U.S. Constitution throughout American history, their minions interpreting it to eliminate what stands in the way of profits for the already wealthy few and the wars that broaden their power to plunder by raid and trade. The last thing the present self-appointed masters of the universe want is for the public to see Obama and Sarah Palin as “Tweedle-dee and Tweedle-dum.’ They shall be meant to appear and sound as if they are both opposing what the other stands for, when in reality they both stand for capitalism and imperialism as usual , unchanged and challenged. If there is a nuance of difference between them, it lies in the Republicans openly favoring great private concentrated wealth while the Democrats serve and pimp for the same private interests. But both The GOP and the Dems use government to help tighten the grip of those that fund candidacies and pressure those elected to office. Instead of being subjected to the usual made-in-media situation-comedy of a fake confrontation between two like-minded imperial capitalists, an ethical United States of America, confident of its future, could allow for a productive exploration of reality with Obama and Sarah Palin on the same side facing off with empire critics Socialist Senator Bernie Sanders and progressive Democrat Dennis Kucinich. But such a real confrontation wouldn’t help the gangsters divide and rule us.